…you’d end up with a parameter where you can choose any customer to filter on – and there are 18485 customers on that hierarchy. On my laptop this query executes in just over 1.5 seconds. Not bad, you might think, for a query that returns a fairly large number of rows. But we can do better! You’ll find you get almost exactly the same data back, although this time the query returns in around 0.2 seconds. A few things need to be noted here. First of all, although MDX allows you to put an empty set on columns, in the query above I had to create a dummy calculated measure that returned null because otherwise the query didn’t return any rows from the OLEDB data source. Secondly, in the new query the All Member unique name and caption come out as nulls – that’s normal behaviour for flattened rowsets (which is what you get when you run queries through an OLEDB connection), unfortunately, and again something we’re going to have to work around ourselves. Thirdly, we also need to create a column with indented member names – the original parameter dataset did this using a SSRS expression in a calculated field – although in this case, where there’s only one level underneath the all member, we could probably skip this and not hurt usability. You then need to delete the original parameter dataset, point the report parameter to the new dataset and bind these two columns to it value and label fields. And lo and behold, you have a report that runs just over a second faster than it did before. This might seem like a lot of hassle to go through for such a small gain, but if you have more than one large parameter the time savings will add up and your users will notice the difference. Any idea why the performance gain is due to? Did you get a chance to look at the profiler? I was just thinking why there is so much of gain. Profiler doesn\’t tell you anything here. I think it\’s just that the rewritten version goes direct to the formula engine to get the properties, whereas the original has the overhead of calculated members. But I\’m not really sure. Thanks David – that\’s very useful to know! 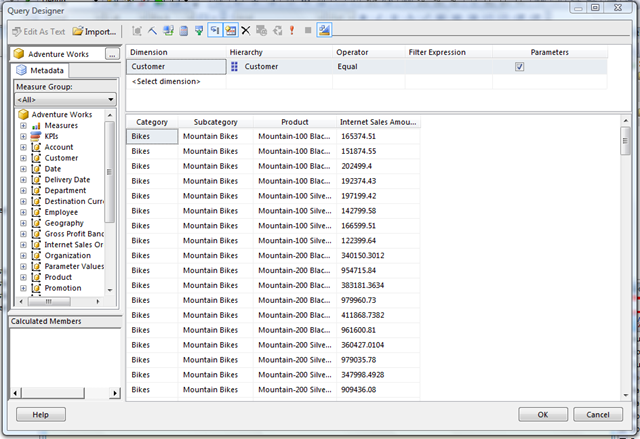 For performance I usually run the parameter-MDX as part of SSIS after recalculating the cubes. I store the result in a SQL Server table and pulls the parameter list from the SQL-source. I guess this will always be the fastest way to load a parameter list in SSRS. Was just wondering about your comment on the query being faster maybe because it picks from the value from FE. Since the WITH clause is there, wouldn’t it be from the SE cache rather than the FE cache? No, what I meant is that the value is being calculated and returned by the formula engine. The presence of the WITH clause would prevent these values being cached after the query has finished, but I assumed in this article that all queries were running on a cold SE and FE cache. then the only difference in the trace activity was the query dimension for the one measure. which indicates that around .2 secs were being used for the Query dimension activity for each measure being displayed. Disclaimer : Test conditions might not have been ideal, but each scenario was tested 3 times each and all times, similar results were returned. It returns exactly the same data and avoid the WITH clause. The problem with this approach is that you can only query dimension cubes (ie use $DimensionName in the FROM clause) if you’re an administrator, and you probably don’t want to let SSRS connect to SSAS using an administrator account. I totally forgot this limitation ! For sure it’s not an option in the “real world”. But there’s another problem with this query – which is why I didn’t use this approach in my post! 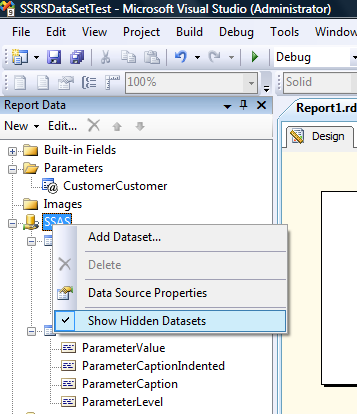 If you use this query with the SSAS data source it doesn’t return the dimension properties; and if you use this query with the OLEDB data source then it doesn’t return any rows. The reason why I used a dummy measure is to get around this second problem. I’ve tested it with the SSAS data source. I’ve added the 2 calculated fields to fix the All Customer UniqueName and indented Caption as you explain in your post and it works without any problem. I use the 2008 R2 RTM version (with CU6) maybe you encounteur the missing property behavior on another version ? I’m using R2 but not CU6 – maybe it’s been fixed, then. I’ve tested the query on R2 RTM (w/o any CU) on a another machine and it works. In fact, It works also on SSRS 2005, once again with SSAS datasource, so I’m confident it will also work on 2008. What I’ve noticed, is that the DIMENSION PROPERTIES must contain UNIQUE_NAME (and not MEMBER_UNIQUE_NAME as query designer put by default) and in this case you will have one field named as well which contains the correponding data in addition of the Caption one. I am facing a problem with SSRS parameters passing for summary to detail report (implementing drill through functionality) . My datasource is SSAS Cube. Can you give more details about what you’re doing exactly, and what the error is? Thanks for reply. Actually, I have 2 dimensions (i.e geography and time). geography dimension as country, ,state and city roll-up. Time dimension as Year, Quarter and Month roll-up. When, I extracted only the MDX Script from the sql profiler trace. I noticed that when detail report execution the MDX script to load Month’s parameter’s dataset is executed before Quarter Dataset. I’m not really a SSRS expert and I don’t know the answer to this one – have you tried asking on the SSRS MSDN Forum? I was hoping this would work with the Tabular Model, but it doesn’t seem to. As results, I only get the member caption and the measure columns. No unique names or levels. Does tabular model not recognize member properties? It works ok for me – can you try using a DMX query instead of an MDX query in SSRS? Hmm, which version of SSRS are you using? Hmm, well sorry, I have no idea what’s going on here I’m afraid. Hi Mukesh, to be honest I’m not the best person to ask these questions. Can I suggest you post them on the SSRS MSDN forum? I have already posted above question at SSRS MSDN. I get reply on this. but I still have one doubt .